Surrey; England international Frank Lampard has been banned from driving for 90 days. The Chelsea footballer, who did not appear at his sentencing at Staines Magistrates’ Court on Friday, had previously pleaded guilty to driving at speeds of 91mph and 92mph in a 50mph zone. 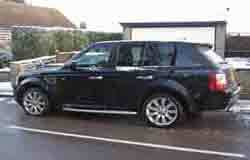 He was caught in a Range Rover on the Esher bypass in Claygate in March 2010. It was the ninth hearing into the incident, none of which Lampard has attended. At a previous hearing, his solicitors Freeman and Co, said his non-attendence was due to Chelsea training and child care commitments. Lampard is one of several footballers to appear in court in connection with driving a Range Rover. See LRO's earlier story here on LRO.com. Kent; A golf club is counting the cost of a wave of car crime in Westerham after joyriders took a vehicle and caused £10,000 damage to greens. The vandals stole a Land Rover Defender from outside Squerryes Estate and wreaked havoc at the course which will take weeks to put right. Police have branded the trend of car thefts as 'creeper break-ins' – where criminals believed to be from London steal vehicles to then commit other crimes. They then make a quick escape via the M25. John Warde, who owns Squerryes Estate, has spoken of his 'frustration' after the burnt-out shell of his green Land Rover Defender was found dumped on Kent and Surrey Golf and Country Club course, Edenbridge. The culprits were seen making off with the Land Rover on CCTV at about 10.30pm on March 4 after hot-wiring the vehicle, which had been left parked in front of Squerryes Estate.